Is there a time and a place for a fast, healthy lunch? Absolutely. Ideally, fast food isn’t a daily event, and you have your homemade breakfast and lunch prepped and ready before you tuck yourself in the night before. But let’s face it, sometimes that just doesn’t happen because the dog gets sick, there’s nothing in the fridge or you’re too busy to pull off the prep work. PRET a MANGER: my very first choice, Pret has a ton of healthful choices in grab and go cases. It’s also easy to choose a bottle of seltzer and they have a healthy tea selection. CHIPOTLE: A healthful salad bowl is the way to go here. Limit yourself to only one serving of the fats and load up on the veggies and lean protein. Salad bowl: Bed of lettuce + black beans OR grilled chicken + sautéed peppers & onions + salsa + corn salad + guac on the side (use 1 oz or ½ the container). 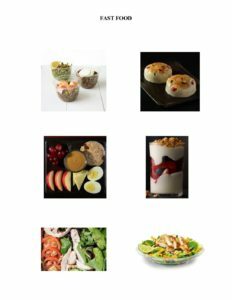 STARBUCKS: There’s a Starbucks on almost every corner, and in a pinch, you’ll do pretty well to stop off for a meal and stay on track with a healthful option. McDONALDS: If the only eats in sight are the golden arches, there are even choices here.